First published December 7, 2018 , last updated April 8, 2019 . Reading time: 4 minutes. 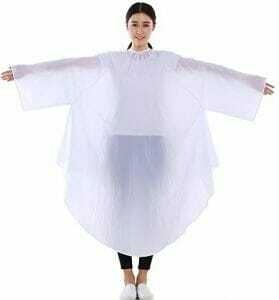 Hair cutting capes are one of the simplest and most essential materials for those of us who enjoy the salon experience at home, or just a quick way of picking up the excess hair. Typically made of plastic or other waterproof materials, these easy to wash cloths keep hair and chemicals away from our clothes, and also help to save time at clean-up. Who needs a hair cutting cape? The hair cutting capes are the best friend of the messy DIYer that prefers a trim made at their own place, as well as the mom friend that ends up doing all of their friends’ hair (spoiler alert: they are often one and the same). If you would like to discover some of the best hair capes available at a click, take a peek at our suggestions. There are things that can’t be perfected or reinvented, as some of them are just perfect in their simplicity; the wheel isn’t likely to change any time soon, you know? 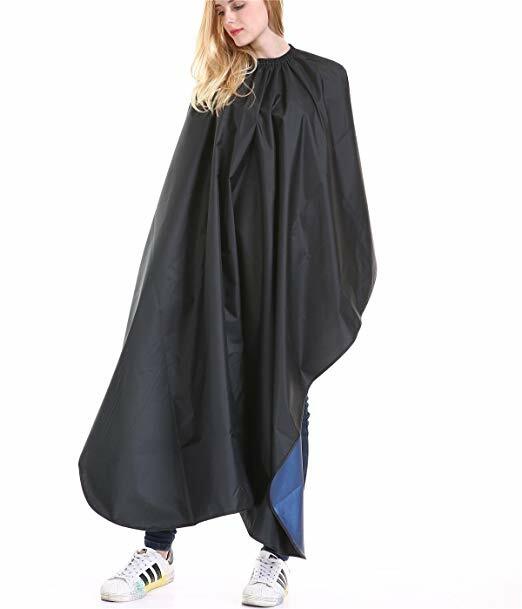 That said, it took a genius to look at a simple hair cutting cape and add a window so you can still use your phone while getting your hair cut. This particular kit comes with two capes, which is perfect if you and your friend are cutting each other’s hair, meaning you won’t have to use the same cape, but that you will also be able to keep up with things on social media. Or just to keep a spare one in case you forget where you put that first one (I wish I could say it rarely happens to me, but I would be lying). 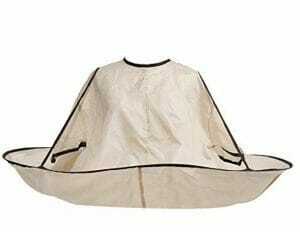 The Vanpower Waterproof Hair Cutting Fold Cloak Umbrella Cape is the perfect tool for those who like to keep their hair short, but keep putting off their trim because they hate dealing with the messy aftermath. Some customers also advise it for those with facial hair, as it keeps it off your clothes and surfaces as well, making it easier to clean up. If you like a tidy space and an even cut, this is definitely the product to keep on hand. Check out the purchasing conditions here. Capes are cool, but while they allow you to live off your teenage fantasies of being a vampire (and doubling as a last minute Halloween costume), sometimes they’re not very practical. Because it is white, it also allows for some hair colors to pop much better, so you will always know where that stray lock is and won’t let it get into your clothes. If you need a hair cutting cape but don’t want just a plain one, we get you. 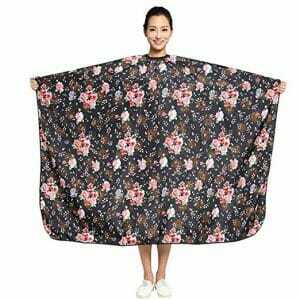 Thankfully, someone is selling this beautiful, lightweight and practical cape with a stunning rose pattern. The best part? It also has an option with a window so you can still keep scrolling and reading. Beautiful AND functional? There’s nothing else to possibly ask for. Why mess with a classic? Sometimes the best things you can get are plain and simple. 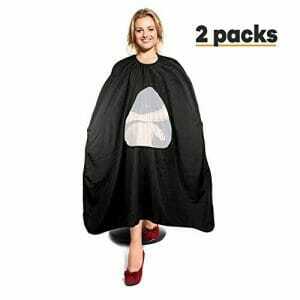 Black never goes out of style anyway, so you know that this cape is both durable and always fashionable. This one in particular is also wine red on the inside, so it will also help bring your last-minute vampire costume to life, if you ever need it to. Check out shipping options here. We hope this list helped you select your next hair cutting cape. They are affordable and mess-free ways of maintaining your style at home, so they are a practical item to keep at hand. Do you use one? Or do you find clean-up easy after you are done cutting hair?